The nocturnal black witch moth - the largest moth in the continental United States, with a wing span of six to seven inches - has been vested with a foreboding aura of darkness and mystery. It bears common names such as Mariposa de la Muerte (Butterfly of Death) in Mexico, Duppy Bat (Lost Soul) in Jamaica, or Sorciére Noire (or Dark Sorcerer) in French-speaking Caribbean islands. According to folklore, if the black witch flies into your field of view, it conveys a curse from an enemy. If it flies over your head, it will cause your hair to fall out. If it flies into your home when you are sick, you will not get well. You will die. On a happier note, if the black witch appears before you after someone has died, it represents the soul of the person returning to bid you farewell. Should one alight on you, you will become rich. Should one land above the door of your home, you will win the lottery. Overall Shape and Size: Superficial resemblance to a small bat. Wings: Broad along insect’s head and body; pointed at the ends; often tattered by rigors of migratory flight. Proboscis: Coiled, straw-like, used for taking nectar from flowers or liquids from other sources. 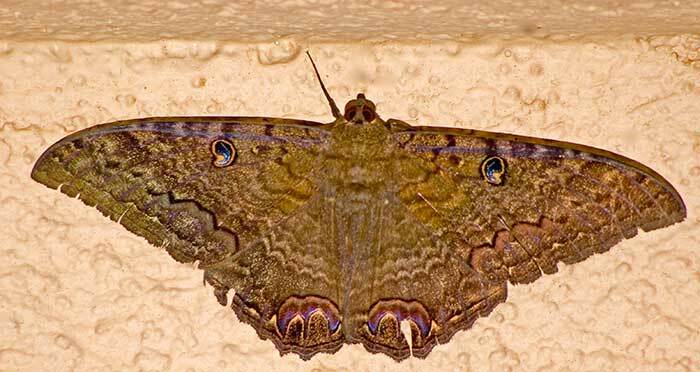 Color Pattern: Wings brown with undulating dark brown or black lines; single black-outlined ‘9’-shaped mark near leading edge of each of its forewings; single black-outlined umbrella-shaped mark near trailing edge of each of its hindwings; marks distinguished by iridescent violent tinges. Female: Slightly larger than the male; distinguished by wavy white line traversing its wings. According to entomologist Mike Quinn, The Black Witch Moth: Its Natural & Cultural History, the insect’s range extends from northern South America across Caribbean islands, Central America and Mexico and throughout the United States. In some locations, the moths breed throughout the year, in overlapping generations. Some populations migrate seasonally, with those of the tropical regions heading north during rainy seasons. Mexican populations, for instance, head north into the Southwest during the summer. Like other migratory moths, the Black Witch flies only at night, well above ground level. It may travel considerable distances, even across open water. The Black Witch stages occasional mass migrations, probably propelled by a population explosion, to seek new territory. Its migrations often appear to be prompted by weather, for instance, storms, falling temperatures, persistent winds, or prolonged rainfall. Like all butterflies and moths - which belong to the advanced insects - the Black Witch has a ‘complete’ life cycle. That is, the adults mate. The female lays eggs. Caterpillars hatch from the eggs, feed voraciously, then spin cocoons. Adults emerge from the cocoons, prepared for a highly mobile life that will last no more than several weeks. The Black Witch favors stands of woody legumes, for instance, the acacias and mesquites of the Southwest. The larvae, or caterpillars - striped and 2 1/2 to 3 inches in length - feed on the foliage of the legumes during the night and take refuge beneath bark during the day. Unlike some other moth larvae, they pose no threat to agricultural crops. Like virtually all moths, the adult Black Witch flies mostly at night, attracted to the nectar of flowers, the juices of fallen fruit or the sap of a legume. It rests during the day, oftentimes on the walls or under the eaves of entranceways, porches, garages. While the Black Witch is active primarily at night, with the darkness offering some protection, it sometimes falls prey to birds, for instance, the House Sparrow or the Loggerhead Shrike, according to Quinn. It may become a meal for a bat or even an occasional meal for a spider. Unlike the butterflies - colorful and delicate nymphs of the daylight hours - the moths - drab spirits of the night - often recall humankind’s mysterious and darker side. “I lingered round them, under that benign sky; watched the moths fluttering among the heath and harebells, listened to the soft wind breathing through the grass, and wondered how any one could ever imagine unquiet slumbers for the sleepers in that quiet earth,” the character Lockwood said, at a graveside, in Emily Bronte’s dark and disturbing novel Wuthering Heights. “Lay not up for yourselves treasures upon earth, where moth and rust dost corrupt...” said Jesus in his Sermon on the Mount. Click here for more about Desert Insects.